Notes: Cittadella is a medieval walled city in the province of Padua, northern Italy, founded in the 13th century as a military outpost of Padua. The surrounding wall has been restored and is 1,461 metres (4,793 ft) in circumference with a diameter of around 450 metres (1,480 ft). There are four gates which roughly correspond the points of the compass. The local football club is A.S. Cittadella. 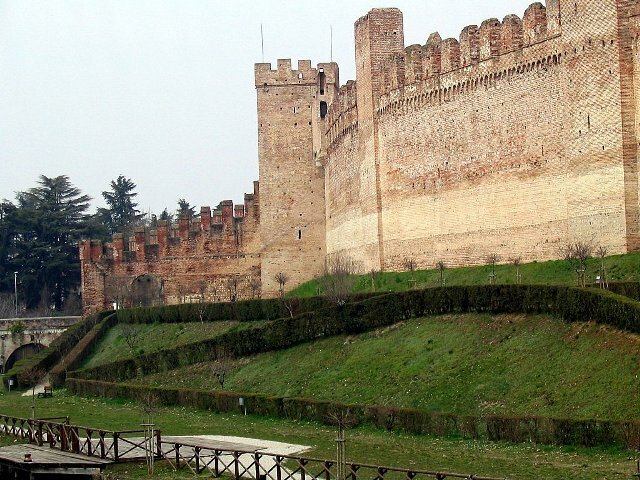 Cittadella was erected in 1220, at the time of the wars between the communes, by order of the city of Padua in order to build a fortified outpost that would defend its territory. It was built in successive stages in a polygonal shape on orthogonal axes through the construction of 32 large and small towers, with the formation of a protective moat and with four drawbridges next to the four entrance gates. Its walls, 14 to 16 metres (46 to 52 ft) tall, were built with the "box masonry": two parallel walls filled with a sturdy core of stones and hot slaked lime totaling a thickness of about 2.10 metres (6.9 ft). The walls today are all intact except for a stretch destroyed in the 16th century during the Cambrai war, and the skilled detail of the construction are still easily visible. It has as many as seven different construction techniques characterized by the alteration of courses in brick and those in river rocks mixed with brick can be recognized.